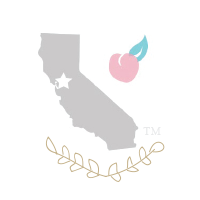 California Peach: Say Hello to California Peach 2.0! Say Hello to California Peach 2.0! Just want to highlight a few changes around here! 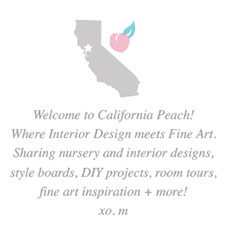 You may have noticed I added the Mary Highstreet Studios laurel wreath design to the California PeachTM Blog Header. My intent in starting California PeachTM was to bring you Interior Design from a Fine Art PerspectiveTM, and although starting out with exactly that and more, over the years I lost sight of the goal and focused more on interiors and less on fine art. In bringing over the Studio symbol I want to solidify the connection California PeachTM has to Fine Art! So this year keep an eye out for Fine Art posts , Style Boards that more prominently feature Fine Art & posts that link over to Mary Highstreet Studios Blog!!! I also changed the layout a little bit to make the two blogs read seamlessly. Visit the grey tabs at the top left to visit the Studio Blog. I've added some Quick Links in the right hand column where you can find Style Boards Archived by Year, a list of Featured Artists, and visit California PeachTM on Social Media pages! I've got lots of awesome content planned for you guys this year including New Style Board Designs, Giveaways, DIY's, Room Tours, and Fine Art Inspiration!!! So take a look around and get ready for even more Interior Design, Fine Art, InspirationTM coming your way!! Baby Highstreet's Room on Project Nursery!! Looking Back | 2014 Favorites!